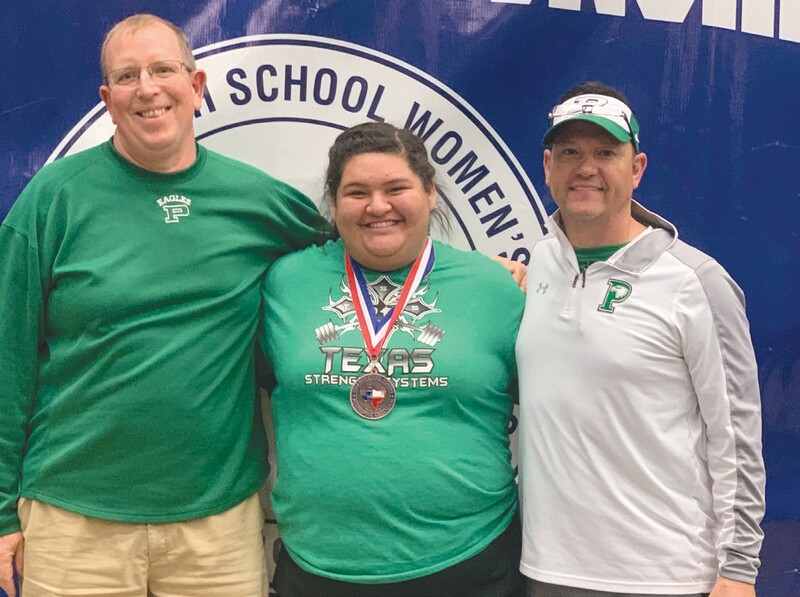 Pleasanton’s Illeana Bosquez survived a tough battle to gain a medal in the powerlifting state meet in Waco on March 15, earning third place. “It feels really good. It was a really good surprise. I thought I was going to do okay, but I didn’t think I would do that good,” she said. Since she had finished ninth in the state meet last year, she did not know she could finish as high as she did. Bosquez, who was seeded fourth in the 259-andup class, started the day with the second-best squat lift of 470 pounds. “That changed a lot,” she said as her squat amount was 10 pounds better than in regionals and was her best lift of the season in that category. With long periods of time between each event, Bosquez had a lot to do in order to stay focused. “It was kind of a long wait. I had to wait, stay hydrated and get ready for the next event,” she said. After lifting 240 pounds on the bench press, she stood in a fourth-place tie with Aliyah Allison of Waco La Vega. There were 15 pounds separating the third and sixth place lifters. She said that she did not know where she was in the standings at that point, recalling that Pleasanton powerlifting coach Stephen Liska did not want her to get nervous before her final event. She came back with a strong effort in the deadlift, hoisting a 370-pound load to beat Leighann Langston of Bullard by 10 pounds in the event. Bosquez’s total of 1,080 pounds edged Langston by five pounds. “All I know is that I had a huge smile on my face,” she said of her reaction to receiving a medal. Bosquez had steadily increased her lift totals throughout the season, and her total in the state meet was five pounds higher than that which she compiled in the regional meet. Bosquez, a senior, said it feels pretty cool to finish her high-school powerlifting career as one of the strongest females in 4A. Bosquez was the second Pleasanton female lifter to medal in the past three years. Overall, the Eagles have had medalists each of the past three years.